I have had this book on my to read list since CBR5 in 2013. This year I decided as part of my overall Cannonball goal of 78 books, that I was also going to work my way through my audiobook and owned book backlog. A little. With that goal in mind I set up a monthly goal list, with a book or two I already own, a book or two I have in audio form in Audible, and then I pick a couple more to take out from the library. In making up April’s goals, I came across The Guernsey Literary and Potato Peel Pie Society in my Audible account and put it on the list. I promptly pushed it off the list to May and here we are. The fun thing about putting a book on your to read list five years ago and purchasing it two years ago means you often go into it completely forgetting why you added it in the first place. I mention this to say that I went in with zero expectations of what this book would be like, or what its format was. 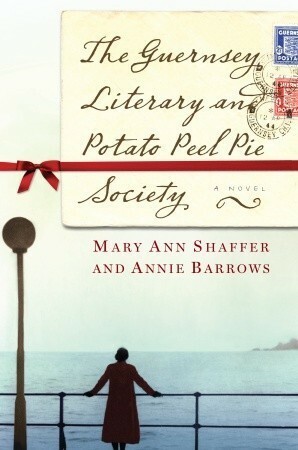 The Guernsey Literary and Potato Peel Pie Society is an epistolary novel, made up of letters, telegrams, and notes created by the characters inside its pages. I am generally unsure about this style, although I’ve quite enjoyed Sorcery & Cecelia, Where’d You Go, Bernadette, and Attachments (yes, that one counts). Which must have been why I decided to try it in audio with a full cast, since that approach has worked for me in the past. It worked this time. I will never know if it was the great narration or simply the beautiful language that pulled me in, but both are worth your time. The Guernsey Literary and Potato Peel Pie Society is structured around Juliet Ashton, an author who survived the Blitz in London, and her various relationships with old friends and new. The new friends are all on the isle of Guernsey, where one of her books ends up. Its new owner, Dawsey Adams, reaches out to Juliet for help in tracking down more books by the same author and the plot is off to a running start. Cannonball Read’s own J Coppercorn mentioned to me on Twitter that this one reminded her in feeling to Anne of Green Gables, and I cannot disagree. It has the same unfolding feel of life on a country island. I also mentioned its similarities to Sorcery & Cecelia, but I’m leaning more towards Tall Pine Polka now that I’m done. In her only book, Mary Ann Shaffer balances between the realities of loss and suffering the island of Guernsey suffered during occupation in World War II, and the ramifications for her characters, but she also layers in the more lighthearted and humorous. That is one of the qualities I most appreciate about Lorna Landvik’s book. Finished by her niece Annie Barrows after she passed, Mary Ann Shaffer is also working through what reading means to people in this book. So many of the members of the Literary Society were not readers before the alibi became a truth, that we as the reader (and likely word lover) get to experience the discovery of the solace, the enrichment, and the joy of books with these characters. And for me, it doesn’t hurt a bit that there’s a little love story woven in as well. Get in now if you haven’t already, its currently being filmed and a movie version will hit theatres next year. I have already said many words about The Count of Monte Cristo, since it entered our lives as the final of the four #CannonBookClub choices for 2016. It was a great idea I had, pick 6 books, three male authors and three female, all predating 1920 which had film adaptations, so we could honor our Pajiban roots, and I could easily check a Read Harder Task off the list (I needed to compare and contrast a book with its movie, you see). Thank you, my fellow book clubbers, because I don’t think I would ever have willingly picked this one up. As it was, knowing my work schedule and family obligations (my sister got married!) I went abridged since I knew I wasn’t going to have as much time as this book probably really needed and deserved. I also had the back pocket win of my friend and yours, crystalclear having voted for this one and deciding to do her INTENSE and awe inspiring review as a backup. Here’s a secret for you: I really love the story that Dumas is trying to tell with Edmond Dantes. While the revenge plots are fun, interesting, and intricate they really aren’t why I continued reading past the Paris purgatory. While I was watching the 1975 Richard Chamberlin version, Abbe Faria says in a voice over “vengeance belongs to the Lord”, and that he hopes Edmond will turn away from his Arya-like list before it destroys him. This to me was the true heart of this work: what is the cost of forsaking that which matters in the world? The great emotional removal of the Count, his single focus on vengeance, is the destruction of Edmond. Villefort, in his decision to put his own position before the life of another dooms himself. Everyone is made to pay for their turning away from the moral right. Was the Count ethical in his actions, yes. Was he moral? I still don’t know. This book is dense, and lush, and there is something for everyone. You can take a twirl through the discussion post, or visit other people’s reviews. I hope if you decided to tackle this one you review it, even if you don’t finish. I wasn’t kidding when I said there was plenty to unpack.